Sticking with the Hefeweizen theme of yesterday, tonight's beer sees the return of the Summer Fruit Beer section. 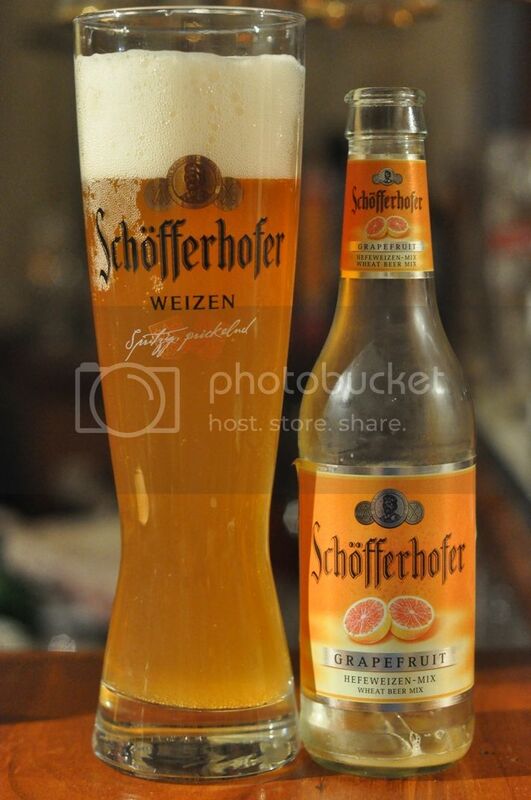 Schofferhofer Grapefruit is a traditional Hefeweizen beer infused with grapefruit juice (obviously!). It's unusual to see a German brewery come out with a beer like this. Most German breweries brew beers in accordance with the Reinheitsgebot, which dictates that beer can only be brewed with water, hops and barley. The Reinheitsgebot was lifted by an EU court of law in 1988 but many German breweries still comply with the purity law. History lesson aside, I'm interested to see what this tastes like. This wheat beer pours a cloudy orange colour with the colour of the grapefruit clearly showing through. There's a good sized head as well, however the retention is a little disappointing for what is essentially a normal hefeweizen. The other thing I will mention about the appearance of Schofferhofer Grapefruit is the clear glass bottle, I hate clear glass bottles! Schofferhofer Grapefruit smells like a soft drink. I know I've smelt this before but I can't quite come up with the name of the drink... Anyway the nose is all grapefruit and citrus hops, that's it though! There's absolutely nothing else to report other than the nose is not beery in any way, shape or form. More cordial than anything else. The flavour is similar to the smell. It taste like a grapefruit cordial with no semblance of wheat beer anywhere to be seen. There are some grapefruit and other citrus-flavoured hops but not alot of anything else. I'm disappointed that there isn't more in the way of the typical banana or cloves flavour that you would find in a standard wheat beer as I think they would enhance the beer greatly. In saying that it's got enough bitterness that it's a very refreshing beer and is one that I would have again. I was pleasantly surprised by how good the "beer" tasted. The only issue I have with it was that it had almost no beery qualities to it. Schofferhofer Grapefruit is quite refreshing and not a bad option if you are after a refreshing drink on a hot day, just don't be expecting it to be a beer. I suppose I would recommend this to girls and people who like cordial, because that's what it tastes like!